Don’t Let Customers Cancel. Motivate Your Agents. Your customer service team isn’t saving customers from canceling and that can be a problem. So, training IS important. But what is more important? The will to do battle with the customer; to handle the pain, anger and disappointment, and keep them from leaving. In other words, your team will only save sales if they are inspired and motivated to make the effort. Your team needs incentive and vision and inspiration to fight that fight. Your team needs a reason for hanging in there to do battle with the customer and keep them active. Giving your team soft skills training and expecting your team to battle nasty customers with fun soft skills on the phone is not very realistic. Sure, that sounds amazing; do companies think that soft skills alone and by itself can beat an angry customer ready to scream and yell, truly? Don’t be surprised at how often companies think that very way, literally. One of the best ways to give your team incentive to battle angry customers who want to cancel is by instituting a new compensation agreement. If you want your agents to save sales, you have to give them reward for the effort. Agents become distrustful when you give them nothing. They don’t have the passion they once had for the job when you want them to save customers for your company, and reward them with no spiff. They simply lose their focus. They end up not caring if the customer wants to cancel. Can management recognize that designing a new compensation plan involves playing with emotions and playing with change? Emotions and change are two combustible elements that may skyrocket (or destroy) performance and retention. Emotions and change that impact money only add fuel to the fire. If you provide your team with strong compensation to save customers, they will value their time and the effort. If your spiff is too little, it won’t do anything. When angry customers call ready to quit they expect a fight. If your team isn’t armed with something beyond cute soft phone skills, your team will never win. Just realize that agents expect fair pay for successful performance. One of the quickest way to lose quality agents to the competition is to forget that agents always want to be rewarded fairly for excellent performance. Please don’t let your team feel that you could care less if they save a sale. You gotta give something to those on the front lines. Saving customers to cancel might be a customer service job, but saving a customer from leaving is all sales. Sales people want compensation, they want commendation, they want reward. When the company doesn’t seem to care, neither will the agents. Create a team game. Hide gifts around the call center. Provide weekly clues as to what the gift might be and where it could be stashed. Of course, clues can be earned based on performance, or, instead of giving out clues each week your management team can surprise agents with pop-quizzes. Those who excel get a clue. Make the prizes worth hunting for. And play a game consistently, at least quarterly and preferably, once a month. Establish a department newsletter. Include a featured article, birthday and anniversary news, upcoming events, product training, pictures and feedback about your business. Make the newsletter simple or glamorous, it doesn’t matter. What does matter is that it is produced consistently, and is both informative and entertaining. A department newsletter is a terrific way to communicate with your agents and impart important information. Use your department Intranet to post past and present newsletters, and both hardcopy and email methods for distribution. Host once-a-month roundtable sessions with your agents. Invite them to communicate their thoughts. Ask for feedback on any issue they’d like to address. Communicate new product information and industry news. Use handouts. Display the employee suggestion box you’ve always meant to put out but never got around to, and make sure your agents know where to find it. Here’s an out-of-the-box idea: Allow agents the opportunity to email suggestions and feedback anonymously from a general email address set up for exactly that purpose, and available from any terminal. That way, agent-management feedback is increased in a simple, user-friendly manner, and the old-fashioned suggestion box goes the way of the, well, the old-fashioned suggestion box. Subscribe to two or three magazines that influence your business. There are hundreds of trade journals and consumer magazines covering topics which can help your agents shine. Place the magazines in an easy-to-find part of the call center. Distribute photocopies of key articles at meetings and at the start of a workday. Highlight important information. Every new day opens up a wealth of possibilities for your agents and your contact center. Each day allows your business to build on past successes. All employees want a fun and motivational approach to work. Give it to them. Think creatively. The whole day is in front of you. Each day is the start of something new in your call center. Build a welcoming environment. Play some games. Teach. Motivate your agents. Remember, a new day brings new ideas, and new opportunities for success. Get your staff together, grab a white board, and get the creative juices flowing. Your agents and the people they interact with will be happy you did. Here are 4 simple ideas, put a little effort into it and recognize how critical it is to inspire employees. · Ask your agents for input about the physical look and feel of your contact center. It’s their work space, and they might as well be comfortable. Agents know what helps stimulate their focus. They know what motivates them to do their best. Perhaps they’ll ask for pictures, posters, windows, a fresh paint job, even new lighting. Better elevator music perhaps. Do what you can for your staff now, and put the rest in the drawer for future use. · Present each agent with a personalized nameplate. Engrave the company and department name along with the agent’s on the plate. Professional sports teams are on the ball with this idea. They show a personal touch by placing a shiny engraved nameplate right on chair of their season ticket holders, with a nice surcharge tacked onto the cost of the duckets, of course. The technique works in the call center too. It gives agents ownership value. Let them decorate the plate to brand it as their own. In fact, management can make each plate a gift to an agent, or distribute them to agents to mark their anniversaries with the company. The power of the gift works wonders. · Put together a department talent show. Group agents into teams and have them coordinate a show, which might take place at the end of the company’s first quarter. Base the show on themes relevant to your business. Have fun with the event; make it as real as possible, with food, judges and costumes. · Money motivates, even when it’s not real! Distribute play money for good deeds, and prepare a reimbursement system for prizes. Use the fake dough to reward a particularly good customer interaction, a quality report, an extra effort, and for agents who work overtime to accomplish an assignment. Have the management team design currency that represents the passion and environment which embodies your contact center. Put executives’ mugs in the middle of a bill in place of George Washington, Benjamin Franklin or Abraham Lincoln. Your agents will love it. Call Center supervisors are the backbone to operations and performance. Supervisors are the management line that directly manages agents and directs the performance of your business. They are the leaders and the motivators that inspire the front line agents and dictate corporate culture to all employees. They urge agents to break records. They manage people, emotions, statistics and results. They train agents in all facets of call center operations — from sales, communication training and company policies, to computer instruction, technical support and product training. Think Of Your Supervisors As The Patty. I analogize supervisors as double patties in a Big Mac sandwich. There are layers above the supervisor and layers below the supervisor, just as there are layers above and below the double patties in a Big Mac. Those layers above and below the double patties rely on the patties to provide answers to how good the sandwich will taste. Those layers above and below the supervisor level rely on the supervisors to provide answers as to how well the call center functions. Both the layers below and above the patties succeed or fail based in great part on the ability of the patties to provide a punch. Supervisors are the patties that provide the punch. They set the table for agent success or failure. If you are a team leader, consider a name change. You are a patty! Your agents will perform well because your supervisors will inspire them to perform well. 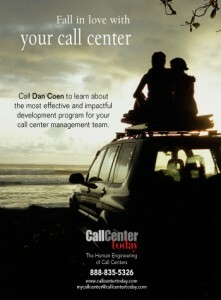 Senior management that forgets this basic tenet probably will not have a call center worth bragging about. When monitoring sessions need to be completed, it is the front line supervisor who completes the assignment. Agents unhappy with their jobs, or their performance, will complain to their supervisor, who carries the message to senior management. Supervisors have to roll up their sleeves and handle disciplinary actions, terminations and promotions. While senior management creates policies and rules, supervisors decipher those policies and rules so the agents can understand them. The ways in which supervisors communicate policies and rules determine how effective those policies and rules are to the culture of the call center. Supervisors teach agents how to sell; they instruct agents to communicate better to customers and prospects. Senior management may take credit for agent performance, but while agents should receive nearly all the credit for their performance, supervisors deserve accolades for keeping their agents focused, energized and prepared. Supervisors Must Keep Agents Calm, Cool & Collected. World-Class supervisors who understand culture and the balance of culture within their call center can put out fires before they escalate into department-stopping dilemmas. Emotions can be manipulated by top supervisors who understand human nature, and the emotional influence of human nature over call center agents. The best supervisors serve as a sounding board to agents when the agents need a wall off of which to bounce ideas and frustrations.